How’s it going so far, a bit severe? Well, I can’t always be ‘Happy, Clappy’ in here, because in the end I just try to reflect what I’m experiencing at the time of writing. I have to be honest with what I feel and so after a couple of pints in the company of some equally disappointed and downhearted FC fans, I got home after midnight on Friday and started to write what I felt. It’s not pleasant this week, you might not agree with it, but it’s just how I saw it when I was still a little raw from the whole experience. Fact is, I was disappointed, simply because Leeds was a benchmark to work from and at present we might not be a team that can scale the heights of seasons past, but we are so much better than that performance!!!! It had all started pretty well. Friday had dawned in Beverley, sunny but really windy. However, as we walked into a KCom Stadium that was quickly filling up, the wind had dropped, the weather was good and the pitch was perfect. No excuses there then! For me, all week Wakey had been a worry, they have seemed a bit patchy this term, but we all know that they are renowned for being a team that invariably does well after a loss. Perhaps we should have told some of our players that, as a sloppy looking warm up, seemed to set the scene for things to come. For the long suffering sports fan, how quickly hope and fortune changes! As they settled into their seats all around me the crowd was still buzzing after that first half showing against Leeds. But, by the time we were 12-0 down, many, like me, must have already seen what was coming. Has there been a game where we haven’t let the other team score first this season? At that point and ever optimistic, my pal Kathy turned around to see my obviously disappointed face and remarked, “Don’t worry, remember what we did to Leeds”, however by then I felt most of us had already forgotten what had gone on last week, for this was certainly different. Their forwards are big, even bigger than ours, even when we have a full pack out and I thought before-hand that we would have to adopt that fizz and verve around a fast play the ball that demolished the Leeds pack, in fact trying to run them off their feet seemed to present our best chance of winning. We all knew on the terraces that’s what we needed to do, but out on the field we couldn’t dictate the pace of the game at all. They simply took a strangle hold on the speed it was played at and just bossed us throughout the match. In fact, so convincing was their dominance that when we fell a try behind again in the second half, you could sort of feel an acceptance that we didn’t have a hope in hell of getting back into it spreading around the terraces. The game had started with both teams testing each other out and it was nip and tuck for the first quarter as no one really looked like scoring, but even then they had been on our line a time or two and had already had more possession in our half than we had in theirs. We looked to be struggling to hold them and their rotating forwards (Pauli-Pauli in particular) eclipsed our substitutions, with only Litten, perhaps the slightest player on the field, making any sort of difference when he came on. At least he buzzed around a bit, but once the size of the opposing pack had sapped his energy in the tackle, in a poor second half no one else looked capable of manufacturing enough to get us anywhere near scoring a breakthrough try. Houghton tried his best with some effect but few others followed suit. I don’t blame our halves because you simply can’t play rugby behind a beaten pack, particularly when the referee is allowing a very skinny 10 and the opposition are slowing the game down and dictating the pace of everything. Houghton’s ball steal over the line to get us back in it was a real Captains ‘knock’ and even if he had come from a position that was a mile off side who cared, we would have taken anything at that point. Then a great try for Fairamo from a Sneyd kick into the corned made it look, on paper, to be a close game at half time; but that was far from the truth. The visitors had wobbled a bit after they saw their star man Johnson fall to a serious injury and as they were perhaps effected by that incident, we scored those two quick tries to add some respectability to the score-line. However, they came out in the second half re-focussed and determined and got the job done, as we went on to give far too many dumb penalties away. In fact, as I said earlier, from 55 minutes onwards it looked to us lot sat despondently on the terraces, that we were simply incapable of adding to our score; and we didn’t! If Leeds had last week managed to march us down the field a time or two through the middle, this time around, Wakefield had done it all night and in the end we were found out and subsequently well beaten. I even left three minutes before the hooter which is unheard of for me, but I was so frustrated at our inability to switch things around, or to at least look to have a plan with which to change our fortunes. So, gripped by the thought that if we played till midnight it was hard to see how we would score again, I slunk off home!! Of course in the cold light of day I realise that we were completely outplayed up front and after that happens in our sport, the inevitable defeat always follows. Being out manoeuvred and outplayed is one thing, but some stuff is unforgiveable. On Friday night our discipline was shocking. We kept giving Wakey a leg up down the field with some ridiculous actions on and off the ball, whilst all around me the crowd kept blaming a referee who certainly didn’t cover himself in glory. If that is his idea of 10 yards I wouldn’t want to be buying a carpet from him!! That said and however much Wakey played him like a penny whistle and constantly appeared to influence him, he didn’t stick lazy arms out and catch players high, push players that were under a kick or hack the ball away in petulance after a move breaks down, did he? So far we have won three games, against a poor Wigan, a struggling Huddersfield and a woeful Leeds, who are through no coincidence, the three bottom teams in the competition! The Wildcats reminded me of that Hull FC team in the games after that lock out defeat at Widnes back in 2016. But, if the West Riding Club looked to be a resurgent outfit, then the way we played reminded me of how far off being a great team again, we currently are right now. Performance wise for me I guess that Litten made a change when he came on, Ratu never stopped trying with the ball but was given a lesson on defending by their left edge, Danny Houghton never stopped probing and pushing and completed 57 tackles, Manu battled gamefully but they ‘saw him coming’ and they even rendered Taylor and Ellis pretty ineffective as well. Meanwhile a pretty mediocre Minichiello was hooked off early and never came back on, whilst for me Thompson was pretty ineffective from the bench too. Kelly was almost totally snuffed out, Sneyd tried hard but got no time or service, Shaul was pretty invisible (although he dealt well with those Brough bombs) and the lease said about the rest the better. For Wakey, well they had the best forward on the pitch in Fifita, who was outstanding and for a big man to play nearly all the first half without a rest, was great to see, we certainly couldn’t match him. Their half backs revelled in the space and time they were afforded, whilst its always good to see Reece Lyne return to the club, but he wants to grow up a bit because on three occasions in front of us his petulance towards the referee and the linesman was an embarrassment to watch. He wasn’t on his own either and several Wakey players, Hampshire and Fifita included, could be seen constantly in the referee’s ear and trying to get Hull players sent off; come on lads that’s football stuff and has no place in our game at all. It was a bad night all round for us all and we can only hope that we get it out of our system and fare better on the plastic pitch in London next weekend, but as you can see, in the cold light of early Saturday morning I was upset by that one. So to our new recruit and you know usually I’m not that hot on the background of players we have signed. The thing is I’m just an FC fan at heart and although I take a massive interest in the game and where it is going, I take little notice much of the personal of other clubs, with of course the exception of the stand out icons, or obvious villains. However, that said, I can honestly say that I do remember Savelio!! As soon as he was mentioned, for me the picture his name conjured up was of a real handful of a player, who was a blockbusting runner and one that could produce a deal of finesse with his hands as well. At 6ft 2ins tall and seventeen and a half stone, he was certainly going to look the part! Yet, who knows how it will all turn out, in rugby such moves are always a risk, but before that injury last year he was acclaimed as one of the greatest prospects in the game, having given up a career at Warrington to go to the Bronco’s, because Wayne Bennett saw the level of potential in him. I remember well when he had starred for Saints against us and someone on RL fans put out the throw away comment that he looked and ran like a young Willie Manu. That comment was an observation that stuck with me; and on reading the message Boards this week, with several other FC fans as well. Willie 2? Muscly bugger isn’t he? Time will tell if he will end up a real Hull FC hero and I certainly expect a tentative sort of start without him exploding back into Super League, but credit to the Club because at a time that other outfits that are short-handed and who are desperate to bring in players, say that the market is such that they don’t exist, we’ve found one who is only 23!! However, now isn’t it a fact that we all like a good conspiracy theory and so as a foot note it’s interesting to debate as to how we pay for him and stay within the cap? 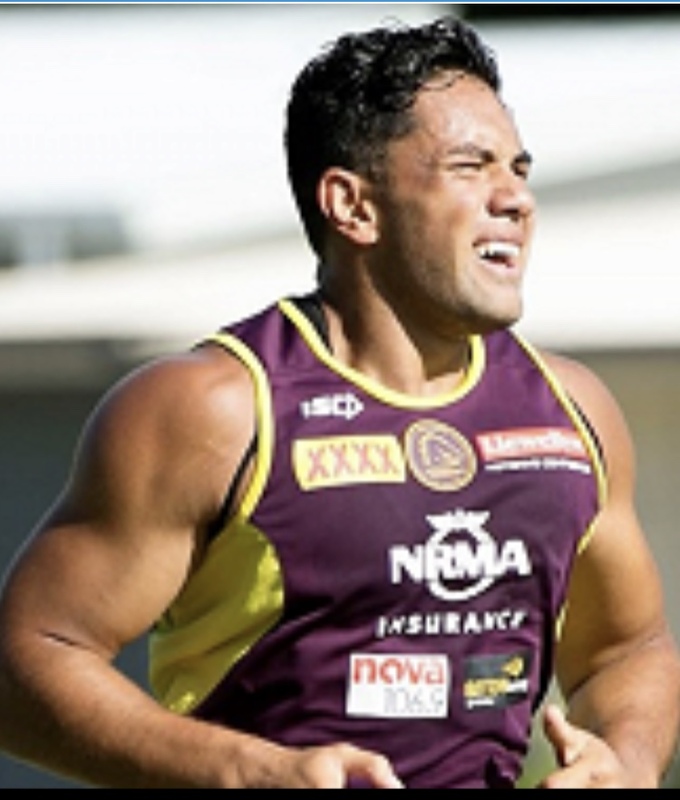 Did James Clark spent the rest of the week at home, sowing some elastic into our salary cap! Do we let players go out on long term loans, do we pay players off, do we used the ‘Garry Hetherington and Simon Moran Book of Creative Accountancy’ or is there another way? Well, loan deals will come into it, but I think the answer is possibly the last option! You see, saddo that I am, every morning I spend a lot of time reading the over-night machinations of the Australian press and it has for a while become apparent that the Bronco’s are over spent wages wise and are absolutely desperate to get down below the cap. I’ve even read a couple of pundit’s intimate since that Savelio was released for that very reason. So, for me it’s likely that some, if not all of Andre’s wages for this year, might just be being paid by the Australian club to get him out of the organisation and thus facilitate the easing of their cap issues. In other word’s I guess that its possible that the Bronco’s might just be paying us a transfer fee (some or all of his first year wages) for taking him on!!!! It’s an interesting one and a distinct possibility, but something that we will probably never ever really know! But a massive well done to Adam and Clarky for facilitating the move and, after that Leeds win, bringing a much needed double whammy of excitement to the fans over last weekend. 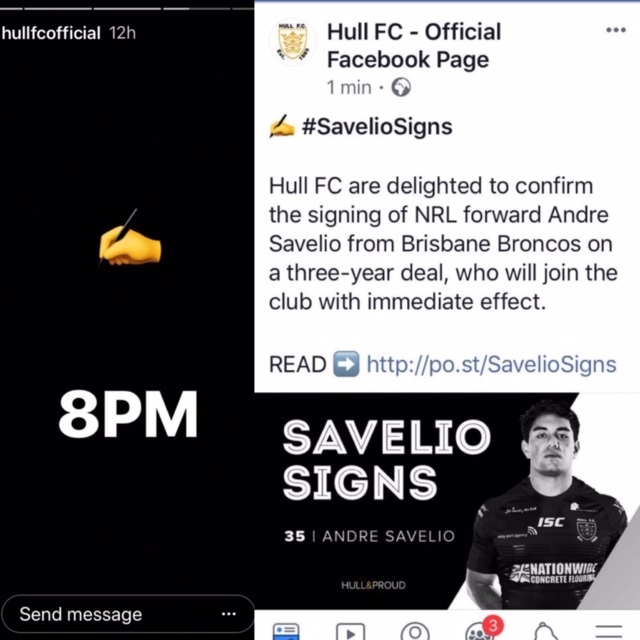 As an addition to that, just a word of well done to the Club for the way that they drip fed the announcement of the news on Savelio too. They certainly showed some foresight, first trailing it as seen below (left) to whet the appetite and then announcing it at 8-00pm on Sunday to beat the Monday RL press who had got hold of the story. That really revved us all up on a damp and windy Sunday night, when the club site went into meltdown as hundreds followed what was happening with eager anticipation. The game needs razzamatazz and spectacle off the field as well and simple actions in the media like that are great and got everyone talking. That I think, just shows the benefit of building a bit of intrigue and anticipation around such events. In here it’s hard to count how many times I have said in the past, “You can’t beat a signing to get everyone buzzing,” and so it was again! With no such signings being made in the closed season, it was certainly a heartening development which the Club handled very well. Well, the news that Brad Fash was on his way to Toronto again came out of the blue and was a surprise, particularly as the day before it was announced he was in the FC 19 for the Wakey game. It all smacked of a bit of chaos really and is probably down to the need to free up some cap space, with our new arrival coming in from Australia. I was surprised because I saw Brad at the Gym on his day off, before the team was announced and he was excited about playing again for the first team. It’s a great move as far as him getting some valuable game time in away from County Road at a good level is concerned, of course it is, but it still came as a surprise. Particularly, because he will find himself a long way down the pecking order by he comes back, with new boy Savelio (who comes as an addition to our current strength up front) Green Paea and Bowden all expected to be fully fit by then. It was a strange one indeed and has to be down to the cap stuff for me. Now, I know sometimes that I worry un-necessarily about my club and fret and fume in here about any little thing that worries me as a fan and it’s true that I’m a bit reactionary at times, but let’s face it, every fan if they have an ounce of passion for their Club, does the same. We are never happy unless we’re worrying. However, in general I get over bad displays like Fridays pretty quickly and unless it actually threatens the future of my Club and the ability of it to remain there for me, in perpetuity, I’m too old these day to worry for long about form and the way we are playing. But when it’s the club where things are changing, I always at least take an interest! You see, I’ve known Adam for years and he is one of the good guys and a tremendously passionate owner and if there’s one thing that has always struck me, it is just how much he has always been his own man. He takes the tough decisions when he has to, loves being at the helm and in control and is proud to have bank rolled our club in hard times and been there as a lone figurehead to guide us through choppy waters when we needed a steadying hand. Let’s face it too, he’s been bloody good at it as well!! We might not always have agreed with what he did, but his actions have pretty much always been vindicated in the end, he’s Mr Hull FC, he’s loved by the fans and I’m sure that means a lot to him. In other word’s our owner has always been a man of his convictions but also a bit of a lone wolf as well. I think that he likes being in soul charge at the top and that suits me down to the ground. However, who else like me was struck by his programme notes in last week’s Monthly Magazine, when he said, “There is no one presently interested in personally investing to get on the Board of Hull FC. Other clubs such as Warrington and Saints attract investment at Board level, but here at Hull that investment in club shares is very hard to find”. So, what do we make of that? Have we been looking for someone to come on the board? Did you know that Club shares for potential investors at Board room level were on offer and if they ain’t, what was all that about, coming as it did completely out of the blue? Should we worry that it indicates we are in need of a cash injection, is he still happy at the Club, or, in a game that is visibly struggling financially, is he just subliminally floating something that is indirectly aimed at any potential backers who might be out there, perhaps to just make them aware that there is a potential investment opportunity? I would favour the latter myself, but I honestly don’t know what has motivated such a statement at this time. It certainly came, in the context of his usual monthly appraisal of where we are, completely out of left field. I expect it would take a bit more than my Council Pension to buy in, but obviously if someone is out there wishing to get involved Adam has flagged up the fact that there is an opportunity to come on board. One things for sure, it will be important to Adam as well, (at a club that is pretty stable all round at present), to ensure any suiter is the right person irrespective of what money they can put in, but as I say, it was certainly interesting stuff. It may mean nothing but I flag it up here because at face value it could well mark a change in policy at the top of the club and if it is, it will be one that is worth watching a bit in the coming weeks and months. Moving on from that one, but perhaps related to it, Adam also referred in his notes to the difficulty the game is facing getting new investors into the actual Super League competition itself. I guess that for most Clubs in the game, the one thing that can help out with the current financial malaise we find ourselves in, would be big investment into the sport and its competitions. If that’s not possible then increasing gates and getting more money from the next TV deal must be the next priority and, at least on those fronts, there was some good news this week. Figures released last Friday showed that Super League’s cumulative television audience for the first four rounds has been in excess of 25 per cent up on 2018, with over 1.7 million viewers watching in total. The Wigan v Leeds, Round Two fixture, attracted the biggest TV average audience so far of 250,300, while the average home attendance at games at present is 9,185 and that is the highest it has been for those initial rounds in the last five years. That’s a real vindication of the Clubs deciding the season opening derby schedule and working on selecting the televised games with Sky in the following rounds. In addition to that I didn’t realise that we were now running a paid-to-view streaming service that has beamed live matches into Spain, Norway, Poland, Philippines and UAE and the RL reckon that the new rules are proving popular too and working well. On the pitch matches have lasted on average just over 91 minutes, which is more than seven minutes shorter than those in 2018 and that speeding up of proceedings has seen games faster and more exciting as well. That in itself is a massive improvement! All those are small steps forward, but it certainly vindicates Elstone and Co. and their actions on the new structure and rules, which have certainly improved the sport as a spectacle. Small steps perhaps, but incremental still one’s that take us towards the long term aim which sees us focussed on the bigger panacea of getting a better and perhaps more diverse TV deal in 2021; only a big improvement in quality and the interest there is in the game will get us there, but it’s certainly so far so good and for me, we’ve started well. Now I must here mention the sad demise of Keith McNee who fell ill at the KCOM Stadium, during the Leeds game and who died shortly afterwards. As many said, no one should go to a game to support the team they love and not come home again, but Mr McNee was taken to Hull Royal Infirmary where he passed away. Those of you who have read my second book will know that I lost my work mate and great pal Charlie the same way at a Wigan game at the Boulevard, when he died in his seat next to me and for those who experience it first-hand it is such a ‘heart breaking’ thing to witness. I commiserate with all who knew him, because the whole incident surrounding Charlie certainly stayed with me for a long time. The Hull Club back then dedicated the victory over Wigan to Charlie’s Memory and it was good to see our Administration doing the same thing with Keith and conducting a minutes silence this time. 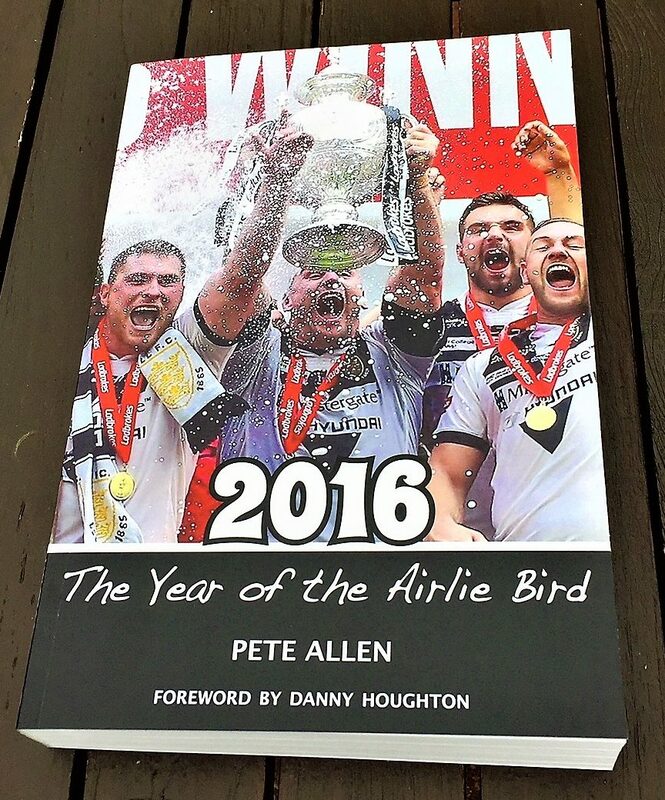 This is of course Rugby League, so it is no surprise as well that tributes have since poured in from friends, family, and fellow Hull FC and Hull KR supporters, to a true fan who had been involved with following the team he loves for the past 70 years. However, my heart goes out to his family and loved ones at this time as we add another ‘Old Faithful’ to that ever growing ‘terrace in the Sky’! God bless and comfort you all and R.I.P. Keith McNee. Last week I touched on the chaotic state of Walton Street and the fairground car park before the Leeds game and it seems a lot of folks didn’t even get in the ground by Kick-off time. One reader who just got in for the start, by the skin of his teeth, seemed to encapsulate the feelings of several readers when Kevin H. wrote, “I was stuck [ yet again] on Chanterlands Avenue for 30 minutes on Friday night and am still aghast why for the sake of two stewards for one hour on minimum wage the S M C risk a train accident on the Spring Bank level crossing and also at the Walton St. junction where traffic coming from Willerby trying to turn right into Walton St. have to barge their way in. On top of that frustrated drivers take the outside lane on Spring bank and force their way into Walton St as well. I left Cottingham at 6.40 and just got to my seat at kick off”. I know that says it all for a lot of folks but for myself it wasn’t all plain sailing that night either. The fact is when I left the Stadium at the end of the same game, one of the big barrier gates between the concourse and West Park was also locked up causing a real crush as folks tried to get back to their cars and buses on Anlaby Road and pressed through the one gate that was open to do it. It does seem that there is still a bit of a slap dash approach to managing events at the KCom. It’s a great Stadium but it does let itself down sometimes. Anyone watch the game at Hudderfield on Thursday? Well, I usually turn the sound down to get rid of the innate ramblings of Eddie Hemmings, but this time I did it to get rid of that infernal cowbell which seems to be struck in the crowd two or three times a minute. That is of course just the monotonous row we experience throughout the game every time we play the Giants. I have often said in here that it resembles a host of their fans bringing their mothers kitchen utensils to games and bashing them for all they are worth. However, it was revealed this week that there is one guy and loyal fan who is the main offender. You may never have met Josh Eastwood, but if you’ve ever watched the Giants then you’ve definitely have heard him, or at least the noise he makes with that ruddy cowbell. The 18-year-old isn’t bothered about that or the ear-churning racket he generates, in fact apparently he loves it and in the end it is only a light-hearted attempt to generate an atmosphere at Huddersfield’s sparsely populated ground. The kids doing his best in supporting his team, which with the Giants can’t be easy at times, but I just wish he would change the instrument; that band at Leeds is bad enough but at least they are tuneful. Well, sort of tuneful!! I was reading this week at depth about Salford, a club that is doing well on the field of late, but who are, since Marvellous Marwan left, struggling a lot off it! You know, with their poor gates and flagging fortunes over the past few years it’s hard to imagine that back in the seventies they were THE Club. Always innovative and boasting a team sheet full of stars, the club were first to play on Friday nights and sign top Welsh RU players, whilst they also developed what was in the end one of the best social club’s in the North West and had fantastic floodlights. In fact, even in the mid-nineties they had a couple of really good seasons. I remember back in 1996 when they were on top of the league, unbeaten after 5 matches and it was their turn to visit the Boulevard. Summer Rugby had arrived and our sixth game on 12th May saw them come up against an FC outfit that had lost three (all away) and won two (both at home) but who were still trying to find their feet under a new coach. The Salford side boasted some star names such as Nathan McAvoy, Steve Hampson, Sam Panapa, Cliff Eccles (Boy, he’d been a regular at the pie shop) and Scott Naylor. Looking back, I think it was Colin Morris who refereed that day, but because of some bleak years there were just 3,350 in attendance when Gareth Stevens kicked off for the black and whites. What a game the “stay away” thousands missed that day, because by the time the hooter went we all knew we had seen one of the most exciting games the Boulevard had witnesswed since the Brian Smith era. It was our sixth home game that year, three in the cup (which was played in consecutive games at the start of the campaign) and three in the league, and although we had been pretty unconvincing we had managed to be defeated just once, by Widnes, who knocked us out of the Cup in the 6th Round. However, the visit of Salford was a really big ask! Stood watching from my ‘lucky step’ on the Airlie Street Terracing, the game was played at what can only be called a blistering pace and the lead actually changed hands three times before the interval. Things started dramatically when, in the thirteenth minute, just as we broke the line, we were called back for a dubious forward pass, Chico Jackson, never backwards at coming forwards, showed some dissent and Steve Blakeley popped over the penalty. This seemed to rev us up a bit and the first of our tries followed just minutes later, when Tevita Vaikona carved open the Reds defence down the Threepennies side, only to be brought down 6 yards out. However, all was as not lost and from the resultant quick play the ball Stephens sent Gary Divorty crashing in. Then Forber scored for Salford following a great looping pass out wide from Sam Panapa and as the visitors commenced to throw the ball around and backed up superbly, it looked as if it wasn’t to be our afternoon. Siggy, (Phil Sigsworth), our new coach then put on Jon Aston who had an instant impact. Hewitt was held over the line on his back, before Aston, stood in the centre, took a ball straight from the resulting scrum to crash in from 15 yards. The next FC try was one I still remember vividly today. Gareth Stephens, flipped the ball into the air behind him, it seemed to hang there for an age before Divorty ran onto it at half way, crashed through full-back Hampson’s tackle and sped to the line with about 6 players in pursuit. He just got there and collapsed in a heap over the whitewash, under a pile of opposing players. That put us 16-8 in the lead with half time approaching but then Nathan McAvoy scored a great try, running diagonally across the Hull defence beating player after player. He then stepped once, then twice and straightened up to sprint 45 yards to the line, so that at half time the score was 16-14. The second half was not even old enough for everyone to have returned to their places from visiting the old lady with the black finger nails and nicotine stained blonde hair in the hot dog caravan, when a clinical move saw our exciting winger Marcus Bai race twenty yards around and outside their defence to dive in at the corner. Hewitt converted from touch and for a while we could all breathe a little easier. Next, some sloppy handling saw Webber drop the ball and Blakeley hack it on and then dribble through to score for the Reds, who subsequently landed a penalty, that saw the game tied at three quarter time. There then followed the bit of luck we needed to get back in front. Hampson brilliantly fielded a massive bomb from Webber right in front of where we were stood, but then in his haste to get up he fumbled and obviously didn’t play the ball properly, we screamed at the ref. for justice as he tried to play on and at last a scrum was called. From this, a good set of drives up the middle saw Fisher receive a short pass from Moffitt to dive over the line and we were back in front. A Hewitt penalty gave us an 8-point lead with just 9 minutes to go but back came Salford and three penalties on the spin saw them camped on our line. It was heart stopping stuff as the defence of our forwards particularly Dave Moffitt, Andy Fisher and Steve Craven was brilliant in those dying minutes and although Lee side stepped his way over for the Reds with two-minutes left, we held out for an exciting, if not unlikely 30-28 victory! As soon as the hooter went the crowds leapt (as was the case in these games), over the barriers and onto the pitch to congratulate their hero’s. But all I remember at the end was the feeling of just being thoroughly wrung out by all the excitement, I just stood there clapping and singing “Old Faithful” for all I was worth. It was without doubt one of the finest performances by the FC team in the whole of the second half of that decade and one I remember to this day with great affection!! So, was I disappointed as I trudged back to the car on Friday? Well, I said after the defeat to Castleford that we would get better, but that I was already then resigned to the fact that we won’t be winning much this year, so I guess I was more frustrated than surprised by the defeat. However, we all sort of hoped that after last week we were on the up and it was the manner of the defeat that was worrying, because we were bossed by the Wakey team throughout. That is a major concern because in Rugby League you have to turn up and you can’t live on past, or even the previous weeks, glories. We have to get back at it next week, but with London’s current form that is not an easy proposition at all. It was great this week to see West Yorkshire based Diary reader Richard Watson as Club Supporter of the Week for its certainly an accolade that is deserved and it was also good to hear from my great pal and kindred spirt Uppo too last Tuesday. We shared Wembley 2016 together and that sort of camaraderie certainly stays with you forever! In addition, well done to my Pal ‘Northern Soul’ Neil who braved the game on Friday suffering with Pneumonia and to Adam DesForges who struggled there following a very recent knee operation; brave souls deserving of better on the night me thinks!! It was also great this week to hear from Ian Findlay, Barry King, Jeff Smith, Jim on the South Bank, Harry in the Channel Islands, Mike in Cheshire, ‘Chemical’ Reg, Ian Middleton, Alec Smith and the many others who were revelling in that victory last week. As I said in starting, what a difference a week makes eh? This week it’s going to be so tough in London and it will be interesting to see how we approach it and who is picked to play. One things for sure hundreds are making the pilgrimage and well done to everyone who is going. Thanks as well to all you readers who have got this far in a depressing old Diary. We can only hope for better things to come and in the meantime let’s all try to Keep Believing!